April 11, 2016 to April 17, 2016 – Netarus is excited to announce plans to attend Bauma 2016 this Spring in Munich, Germany. As many know, Bauma is the world’s leading trade fair for construction machinery, building material machines, mining machines, construction vehicles, and construction equipment. This year marks the 31st anniversary of the much-anticipated event, which takes place from April 11th through the 17th. Bauma is the largest trade fair on the globe, boasting of over 3400 exhibits and representing companies from all over the world. The focuses of the event are, of course, the construction and mining industries. These companies will be showcasing the latest trends in construction and mining equipment and machinery. Netarus will be located in the Industry Lounge. 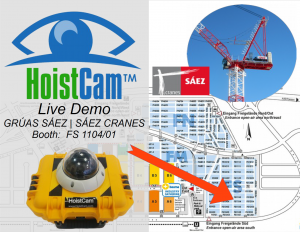 There, they will be demonstrating their HoistCam and HoistCam Director with their European Distributor and see a live demo on a SÁEZ Cranes tower crane. Those wishing to learn more about their products and services can find them listed as “Netarus” within the conference. Interested parties can come and relax with representatives from Netarus in the Industry Lounge and spend a few minutes sitting at our table. Customers can also take advantage of special Netarus prices exclusive to the Bauma show. According to a recent press release from Bauma 2016, “One of the current market requirements for the most diverse types of construction machinery is efficiency—even in small spaces.” HoistCam by Netarus is designed with this in mind. The camera system takes up little space but increases efficiency, productivity, and safety on the job site by large percentages. By increasing the line of sight for crane operators, and giving a bird’s eye view of the job site to managers and foremen, HoistCam can save both time and money on almost every lift. 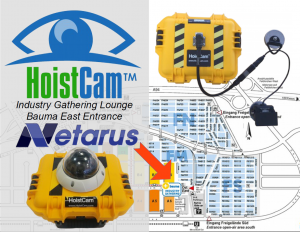 Visitors to the Netarus table in the Industry Lounge will have the chance to witness first hand just how HoistCam works. According to their site, Bauma is “where international key players meet. This is where significant new developments are presented. This is where suppliers and solutions come together perfectly. The 31st Edition of the World’s Leading Trade Fair Bauma takes place in Munich from April 11–17, 2016. Once again, the 2013 exhibition set several new records—confirming yet again its leading role as the largest trade fair in the world.” There will be over five hundred and seventy-five feet of exhibition space with over thirty-four hundred exhibitors. Over fifty-three thousand visitors will be attending from over two hundred countries. Just in the mining sector alone, over one hundred and twenty-five visitors are expected. There will also be almost fifteen hundred journalists and representatives from the media present at the event. No one with an interest in the construction and mining industries should miss it. About Netarus: The founders of Netarus began developing cutting edge technology back in 2002 for wireless, video, and sensor technology, and they haven’t stopped since. In fact, they have continued on to expand into marine, industrial, transportation, and construction industries in an effort to increase efficiency, safety, and productivity in the workplace. They specialize in designing situational awareness platforms for anything from industrial facilities and cranes to heavy equipment and tug boats. Netarus engineers and manufactures their situational awareness platforms for the workplace’s most demanding environments and locations.